Google Nexus phone is a popular brand in Android world. Unlike other Android phones such as Samsung, Nexus uses the native Android OS without any modifications. So if you want to try the pure experience with Android, then Nexus is the best option out there. Take the latest model Nexus 6P as an example, it has a ton of internal memory that you can utilize for photos, videos, audio, and other files. While you gain more power with the incredible memory of Nexus 6P, you are also at high risk of losing your files. With a touch based smartphone, accidental deletion happens a lot because a single tap can delete the item. With consistent system updates, the chance to lost files is also high. If you tried to flash a new ROM but failed, then all the data on the device will be permanently removed. However, if those bad things happened, you scan still retrieve the erased data. In this guide, we will tell you all about a solution to the data you think you have already lost but still can be recovered. Android Data Recovery is a simple yet powerful program that you can use to recover deleted or lost data from Nexus phones. It has a high success rate of recovery, which is better than other programs in the industry. It is able to retrieve a wide range of files including videos, images, call logs, messages, contacts, games, and many more. 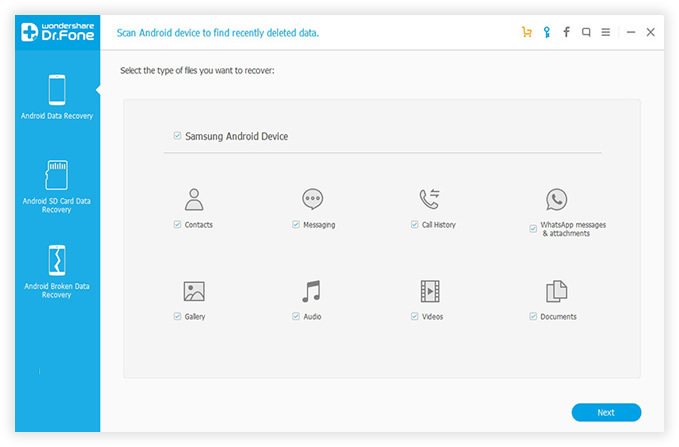 Over 6000 devices are compatible with this program, which means if you own Android devices apart from Nexus 6P, there is a big chance that you can also use this program to retrieve any lost data. Supported File Type: Contacts, SMS, Photos, Videos, Music, WhatsApp and Documents. Click the download button to save the installation file on a Windows computer or Mac. Then install the program by following the default setup instructions. Finally, run the program on your computer. Here is a screenshot of the program. You need to turn on USB debugging and root the phone if you want to fully recover the lost data because the program needs to scan the whole device completely. There is no permission to do that on unrooted Android device. If you already did this, then just connect your Nexus device to the computer. To turn on USB debugging: From Settings -> About phone, find Build number and tap it 7 times to unlock Developer options. Go back to Settings -> Developer options and enable USB debugging on there. To root Android phone, please follow this rooting tutorial. 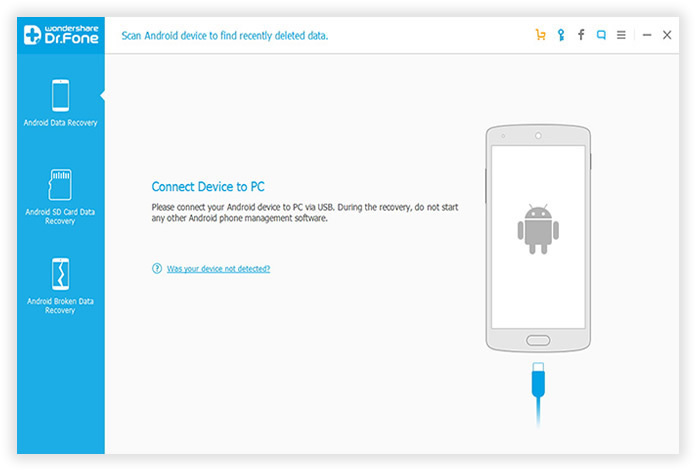 Once Nexus phone or tablet connected to computer, Android Data Recovery will detect the device in a few seconds. Then select the file type you want to recover. After selection, click Next button to choose a proper data recovery mode. Normal, standard mode is enough to find the lost data. If it doesn't work, then switch to advanced mode. Click the Start button to begin the scanning process. 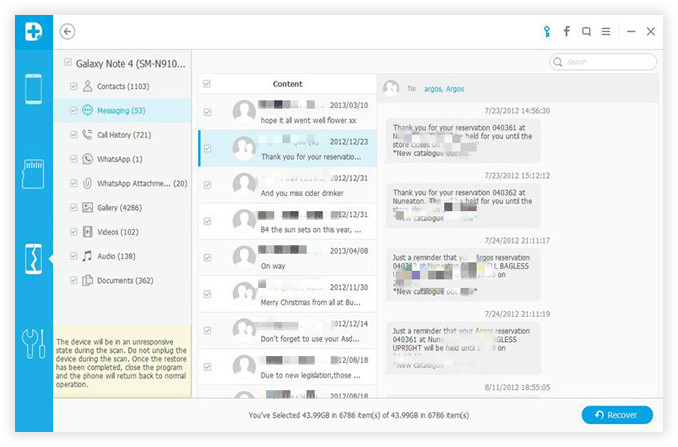 When the scanning is completed (around 10 minutes), the program displays all scanned data into different groups, such as contacts, sms or gallery. Please go to the specific groups to check whether the deleted data on there or not. Mark the selected ones and click Recover button to save them on the computer. 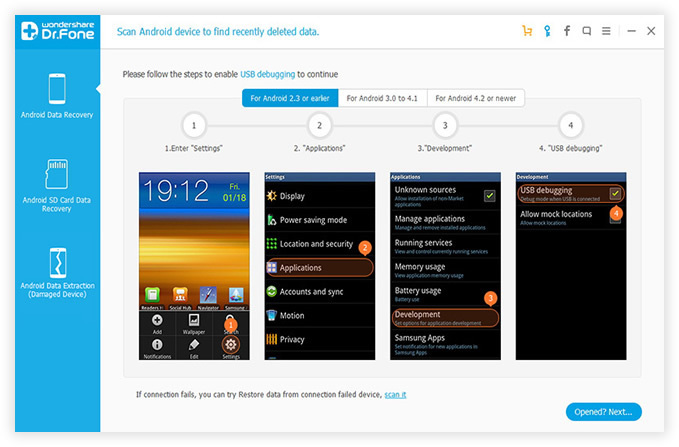 Android Data Recovery is an easy-to-use program that is compatible with numerous Android devices. With flexible recovery options, you can tailor the use of this program according to your needs; you can choose to retrieve all files or just some of your files. Whatever scenario of data loss you are experiencing, you can rely on this tool to save you from all the hassle of losing your critical data. With all of these amazing features and guarantee, you can use this to scan and recover data from internal memory or SD card. You can also preview and verify the data before you finalize the recovery. There is an opportunity for you to assess the reliability and effectiveness of the program.